STOP!!! This is the Wholesale Page for Books I - Q. Minimum total Wholesale Order is $100.00*. Items may be mixed throughout the catalog. The $100.00 minimum does NOT include shipping and handling. Please stay on the wholesale pages when placing a wholesale order. Thanks! Wonderful Fable - for children and grow-ups alike. A good lesson to be learned from this book! Combines basket manufacture techniques, raw materials, form and decoration with information on native life ways. More than 175 different regional and tribal styles from all parts of North America are documented here. Art, Culture, and History. Covers Native American basketry from San Francisco Bay & Monterrey Bay north to Mendocino & east to the Sierras. Beautiful pictures. Lots of information and pictures for weavers and collectors. Collection of patterns for the intermediate weaver including: Bouquet, Coffee Table, Iris Wall, Plant, Plentiful Picnic, Sweetheart, and Heart-y Wastebasket. Step-by-step photos guide the beginner through 6 projects which show how to make a variety of different braids. Tips & suggestions. Quarterly publication containing a minimum of 4 patterns and "Christ Filled Basketmaker's" devotional. Current issue. For back issues, please phone or e-mail for availability and price. Currently the latest issue we have is the Summer 2010 issue. The magazine is no longer being published. Rediscover the art of knotting! Variety of projects with different levels of difficulty. Includes vertical & horizontal half hitches, spiral knots, square knots, and finishing knots. Small projects using threads. 24 braided and beaded jewelry projects on the kumihimo disk. Learn: lacy filigree edging, inset bezels to capture cabochons, wrap around bezels to hold dimensional focals, beaded bezels for breathtaking adornment, twisted-wire and crystal-adorned branches, sculptured wire centerpieces, curlicue lace decoration. 29 projects. Step-by-step instructions for coloring reeds and the use of them in baskets. Patterns with variations for 3 baskets: Market, House (Friendship), and Field Baskets. Provides an account of the Nantucket Basket from historical times to present. Includes tips for collecting and instructions for making a round Nantucket Lightship Basket. Lots of color pictures. "An inspirational guide to creating a wonderful selection of decorative, functional, and amusing shapes for the garden - chairs, fences, arbors, bowers, tunnels, and more." Includes Over 70 Knots and Small Repeat Patterns Plus Projects. Excellent instructions for the 3 directional weave known as "Mad Weave"
Clear designs and directions for making beaded amulet bags. 21 new designs for amulet bags, including instructions for button hole closures & lids. A close look at textile structures. Covers gathering and preparing the willow. Directions for several beginning and advanced projects. Directions for several projects for in and around the garden & yard. 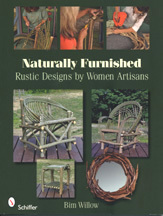 Step-by-step guide to making rustic furniture. The tradition, spirit, and technique with dozens of project ideas. "Richly illustrated in these pages are abstract sculptures as well as representations of the human form constructed of materials both usual and unusual, from threads and beads to sticks and cantaloupe skins." Knotted Jewelry with Beads. 17 fun, colorful projects, each with fully illustrated step-by-step instructions. 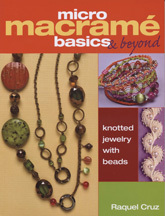 Tips and techniques for knotting with beads. From the "Twenty to Make Series": Designs for stylish jewellery with delicate, colorful cords & lovely beads. 20 designs, 20 alternatives, Step-by-Step Instructions. More creative variations on traditional techniques. Follow-up to Seed Bead Stitching. Projects & Techniques From the Southwest - from jewelry to baskets. Step-by-set guide to make a bow-back arm chair (Anita Willis), low chair & side table (Mary Jane Sussko), & a driftwood mirror frame (Stella Larkin). Techniques, Projects, Inspiration. Handbook for Fiber Artists. Learn looping techniques and variations you can use with many different fibers to create bags, garments, vessels, and more. 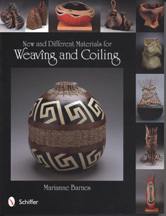 Explores a wide range of materials that can be used for weaving & coiling baskets & decorate gourds. How to find, collect, & prepare naturals. Covers some alternative man made materials, too. "Inventive beading projects that will introduce you to varied techniques. "New Knots, New Projects, New Designs". Includes detailed step-by-step photographs, accompanying diagrams, helpful advice, and inspirational projects. Making Baskets and Doing Geometry in the Makhuwa Culture in the Northeast of Mozambique. 291 pages. Much information & many black & white photos / illustrations. These are the color images for the above book. 67 pages. History of basketry created by women of desert dwellers in California's Death Valley Region. Lots of beautiful photos. From forest floor to finished project. Lots of techniques & over 40 coiling projects, including gourd. 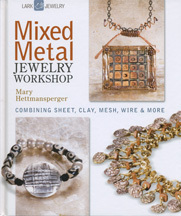 Good book for pine needle and coiling. Covers many techniques and stitches. Includes 10 patterns. Materials for making the Pin Dish Basket. Pattern is in the above book. Kit includes: pine needles, needle, raffia, tenneriffe rings. Twined waxed linen pouch making for the beginner. Covers materials gathering, preparing & plaiting from basic to complicated plaiting, surface decoration, & more. "Vladimir Yarish brings new insight & contemporary concepts to the venerable practice of birch-bark basketry." Covers harvesting, preparing, weaving, assembling, finishing, & embellishing baskets. Wonderful collection of techniques & patterns for simple and complicated plaited baskets. 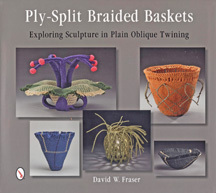 Illustrates the versatility of plain oblique twining, a version of ply-split braiding particularly well-suited for the art of basketry. Reprint of the 1908 book, a classic in California anthropology. History & lots of photos.